Great Smoky Mountains National Park exhibits a wildflower explosion in spring. This unique ecosystem, with abundant water and more than 100 species of trees, is also home to more than 1,500 species of wildflower. But these unique and colorful flowers only appear for a short time – as the ground is warmed by the springtime sun, and before the trees fully leaf out, which plunges the forest floor back into shade. But this short window of just a few weeks produces a miraculous display of millions of vibrant flowers. The Spring Wildflower Pilgrimage annual event has been held since 1950 each year in spring, usually in late April – dates vary according to climate. You will find an annual UPDATE at the bottom of this article. The Pilgrimage ranks as the best way to explore many of the wildflower highlights. Led by experts and park rangers, the Pilgrimage draws people from all over the world to view the wildflower profusion. 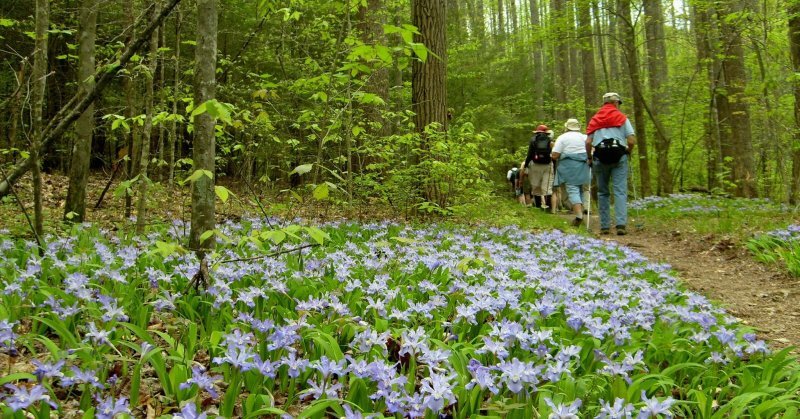 The week-long Wildflower Pilgrimage offers a variety of classes, guided hikes along scenic trails, evening programs, seminars, motorcades, and leisurely walks, all taking advantage of some of the best places and vantage points for viewing the magic of Great Smoky Mountains National Park. The programs offer a chance to enjoy the area up-close, and the benefit of visiting experts who share their unique knowledge and skills. The diverse programs include many on birding – a very popular aspect of the Pilgrimage – as well as ecology and earth science, edible flora, understanding salamanders and other native wildlife, and discovering the many trees, shrubs, wildflowers, ferns, and fungi that reside in the area. Dates for the 2019 Spring Wildflower Pilgrimage have been set for April 24th – 27th. More information about on-line registration will be posted later in the year. If you’re interested in journaling or have a knack for photography, the Pilgrimage includes programs for both. Great Smoky Mountains National Park is the most visited parks in the nation. Along with a diverse culture, the area has a long and rich history, which is discussed and explored in the park history programs. For an idea of what to expect, a few of recent events include an Edible Mushroom Walk, Wildflower Walks, Beginners Photography Workshop, Wildfire Walk, Chimney Tops, Birding Photography, Night Owl Prowl, Black Bear and Wild Hog Walk, Nature Journaling, Salamander Foray, Tree and Shrub Identification Walk, and many, many more. Participation in the Wildflower Pilgrimage is by registration only, and this usually opens in February on the Wildflower website. In recent years registration has sold out in the first weekend! Organizers are still trying to find ways to expand the Pilgrimage, but currently it remains highly sought after and filled by less than 1,000 participants – it’s a rare reward of exceptional value. Registration and full information is available online at the Spring Wildflower Pilgrimage website, and also at the Mills Conference Center in Gatlinburg. The Wildflower Pilgrimage happens rain or shine, and events are never canceled due to inclement weather, unless it’s a threatening severe weather event. Events cannot be rescheduled should it become necessary to cancel due to weather.